Location: South side of Langton Hill (B 1191). Granary Way now runs through the station site. The entrance to the goods yard is in West Street. Present state: The only evidence of the station is a railway gate post at the entrance to the goods yard. The yard is occupied by BA Bush & Sons (tyre dealer). 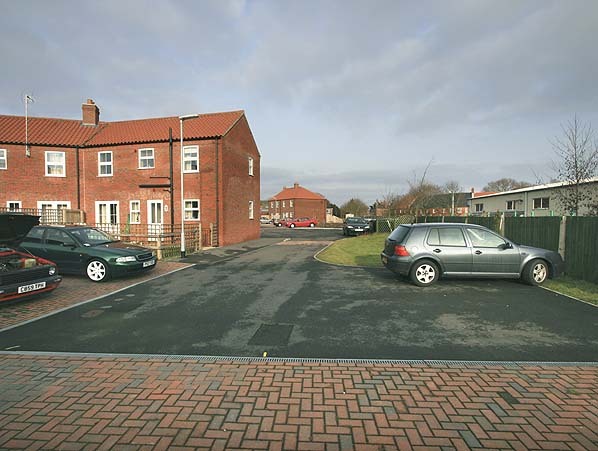 The station site is occupied by the Granary Way housing development. The granary which was rail served is still extant. 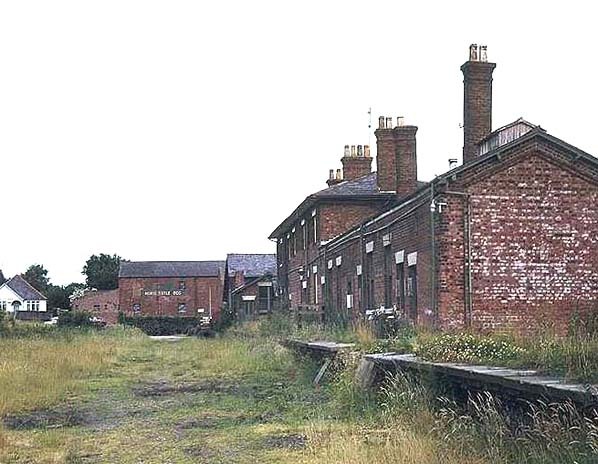 Notes: Horncastle station had a single platform with a run round loop and a large brick building that incorporated the stationmaster's house, booking office, waiting rooms and other offices; the entrance to the booking office was through a stone porch. The platform was extended in 1874 and a new larger waiting room was built in 1900. In its final form it had a short bay platform and an overall roof (later removed). There were two additional goods roads to the west, one of these was connected to the run-round loop by means of the wagon turntable, the other was a dead-end siding serving a long loading bank. 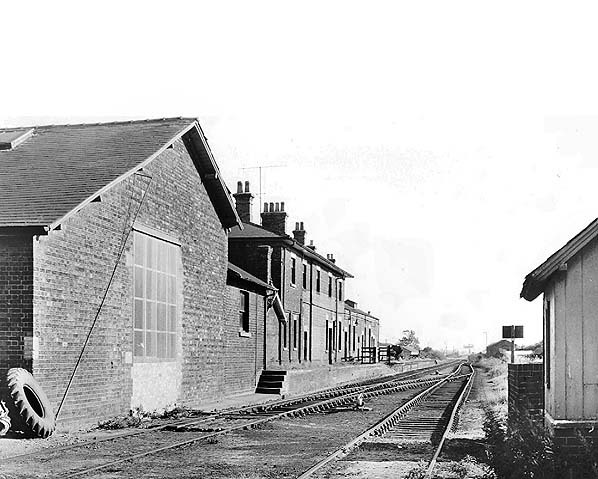 The goods shed was at right-angles to the terminal roads and reached by using the wagon turntable, the shed was enlarged in 1874. The short siding which entered the goods shed actually crossed the passenger line on the level (an unusual feature). There was an additional goods siding on the far side of the loading bank and others on a lower level beyond the bay platform. Unusually, the northern end of the passenger platform ended in a short flight of steps to the ground, instead of the usual ramp. In a sense this was illegal under Board of Trade regulations, but as this end of the terminus was classed as a goods area, the usual regulations regarding passenger facilities presumably did not apply. The 1897 Ordnance Survey map shows a ticket platform to the south of the station close to the engine shed, this had gone by later maps. 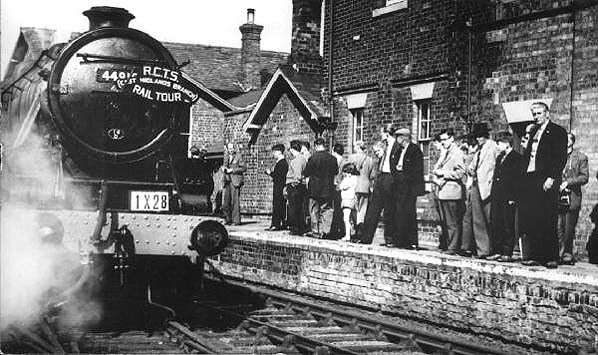 The last steam train into Horncastle was the RCTS Notts & Lincs Railtour on 12th September 1964. 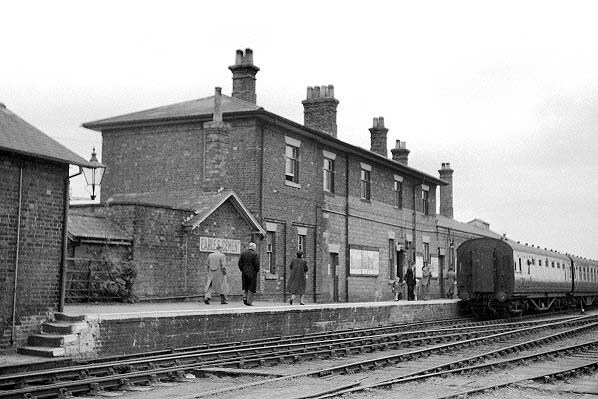 After closure to passengers in 1954, the station remained open for freight traffic until 6th April 1971. The station remained largely intact and in good condition until January 1985 when it was demolished by B. A. Bush, a tyre company that now occupies the goods yard. The station site is now lost under a new housing development. Before 1848 the only town in Lincolnshire served by a railway was Lincoln which was the terminus of a spur from Nottingham. On 17th October 1848 a line was opened from Peterborough to Lincoln via Boston where it joined the line running south from Grimsby that had opened in stages earlier that year. In the early 1850s, Horncastle was an important regional centre which serviced a highly productive agricultural area that supplied corn, cattle, wool, and other produce to the heavily populated industrial areas of Lancashire and Yorkshire. It also held an important annual horse fair and other large stock markets. All it lacked was a rail connection. The main line (Lincolnshire Loop Line) of the Great Northern Railway (GNR), the line which linked Boston to Lincoln, ran along the bank of the River Witham. There was a canal that joined Horncastle to the river near Dogdyke where there was a station. In 1851, in order to facilitate the transfer of coal and other heavy goods, the GNR built a coal wharf and warehouse at Horncastle as they didn't have any funds available for a rail connection. From there, coal was delivered to the surrounding villages. It soon became clear that the area would be better served by a railway link from Horncastle to the main line. Without that, it was feared the town would decline as competition increased from the fairs and markets of other towns served by a railway. 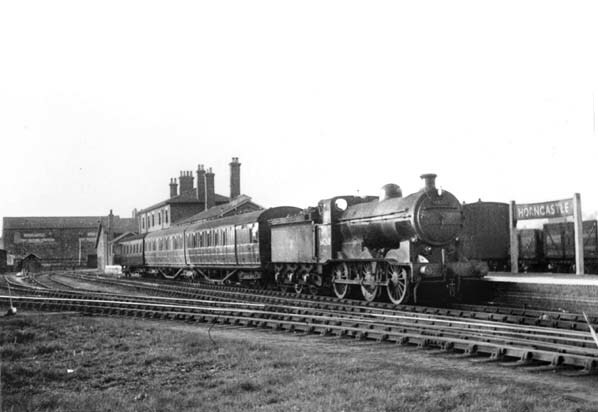 In 1853, three local businessmen were instrumental in forming the Horncastle Railway Company. The objective was to construct a single line, less than eight miles in length, from the GNR's loop line at Kirkstead to Horncastle via the village of Woodhall. Negotiations were opened with the GNR and it was agreed that if the line were to be built the GNR would work it and that the revenue would be divided equally between the two companies. As a result, a Bill to permit the construction of the line, to be called the Horncastle and Kirkstead Junction Railway Company, was presented to parliament. This met determined opposition until it was revealed that the majority of the protesters had interests in the canal company. So, in July 1854, the Bill was passed. It had been hoped that the line would be open by 1st August 1854 but because of the severe winter of 1854/55, work didn’t start until March 1855. With no substantial earthworks, no tunnels and only one road bridge, construction was rapid and the line was completed by the beginning of August. Despite failing its Board of Trade Inspection, the official opening of the line took placed on the planned date 11th August 1855. 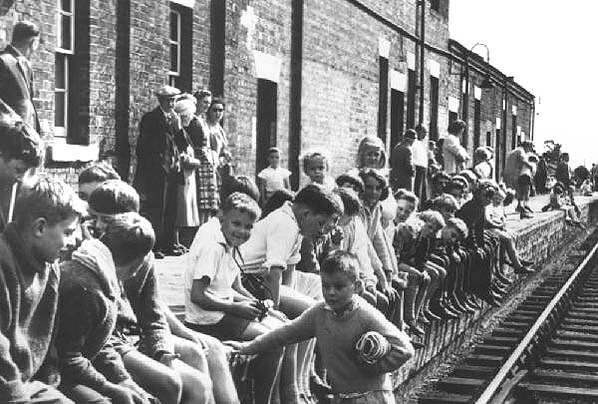 The opening of the line was celebrated with great enthusiasm in Horncastle. There was a grand procession through the town led by banners, musicians, company officials, directors, shareholders and school children, with local people following behind. Contractors worked hard to bring the line up to a safe standard in time for the forthcoming Horncastle Fair and the line was once again ready for inspection on 17th August. This time it was declared fit and opened immediately for passenger traffic and light goods with heavy goods being carried from 26th September. The railway was a single track line just over 7 miles long. It left the GNR line at the small village of Kirkstead where there was a ferry over the river Witham. The junction faced Boston which meant that trains had to reverse after leaving the branch to reach the bay platform that was provided at Kirkstead. From there the line ran north-east through the village of Woodhall Spa where a station with a single platform was built. It carried on for another 3 miles, through a small cutting in a low spur of the Wolds, until it encountered the canal. It then ran northwards, alongside the canal, to Horncastle. The branch was an immediate success with a large number of visitors travelling by rail to the annual horse fair and in order to build on this promising start the GNR offered cheap fairs to London and by the end of the year both passenger and freight revenue was healthy. A small dividend was first declared in September 1856 and dividends of up to 9% were being paid during the late 1880s. Before the end of the century there were several proposals to extend the line including the ill-fated Lincoln, Horncastle, Spilsby & East Coast Railway (HS&ECR) which received parliamentary authority on 16th September 1887 to build a line from Stixwould on the Lincolnshire Loop Line linking the Spilsby and Horncastle branches. The company was unable to raise sufficient capital and the GNR declined an offer to take over the powers when the scheme was abandoned in 1891. Unlike many other Lincolnshire lines, the Horncastle branch continued to be profitable and retained its independence until the 1923 Grouping when it came under the control of the LNER. The line closed on or shortly after 11th September 1939 but reopened on 4th December of the same year. With the popularity of road transport after WW2 passenger numbers dropped dramatically and it now cost far more to work the line than the revenue from passenger receipts. 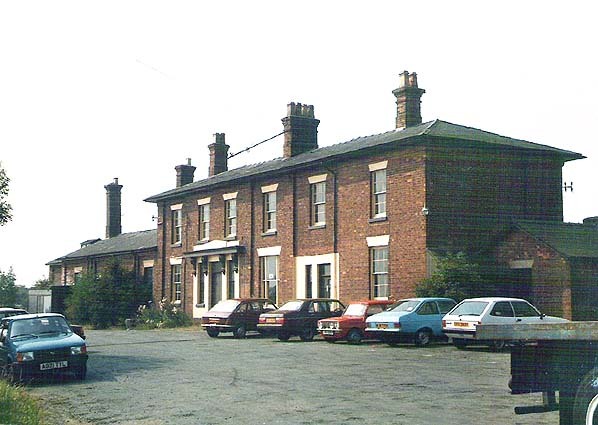 In July 1952, the Railway Executive announced its intention to withdraw the passenger service which could be replaced by the existing bus service if it was re timed to meet trains arriving at Woodhall Junction. With an average of 21 passengers a day over a year compared with 355 using the bus service between Kirkstead and Horncastle the line was clearly not viable. The line would still handle bulk freight traffic although parcels would be distributed by road from Woodhall Junction. There was a vigorous local campaign to fight the closure which lasted two years and at one stage almost succeeded. When a much cheaper diesel railcar service was proposed for the branch, a sub-committee of the East Midlands Transport Users Consultative Committee was formed to discuss the proposals. In July 1953 three of the four members of the sub- committee reached the conclusion that the Railway Executive should withdraw its proposals to close the branch. The Railway Executive rejected the report and closure was announced for 13th September 1954. 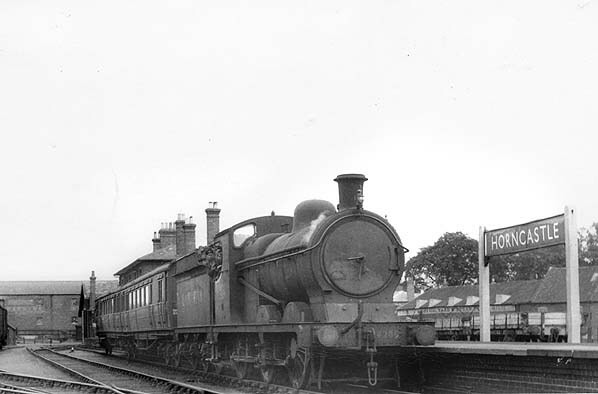 With parcels being handled at Woodhall Junction, bulk freight traffic continued with the branch handling petrol, agricultural lubricating oils, artificial fertilizers, animal foodstuffs, heavy agricultural machinery, coal and tyres for agricultural vehicles until 6th April 1971 when the freight service was also withdrawn. Much of the trackbed between Horncastle and Woodhall Spa was bought by Lincolnshire County Council in 1975 is part of the long distance Viking Way public footpath. Sources: The Horncastle & Woodhall Junction Railway by AJ Ludlam. Published 1986 by Oakwood Press ISBN 0 85361 326 5. Woodhall Spa Community web site & Woodhall Spa Cottage Museum web site. 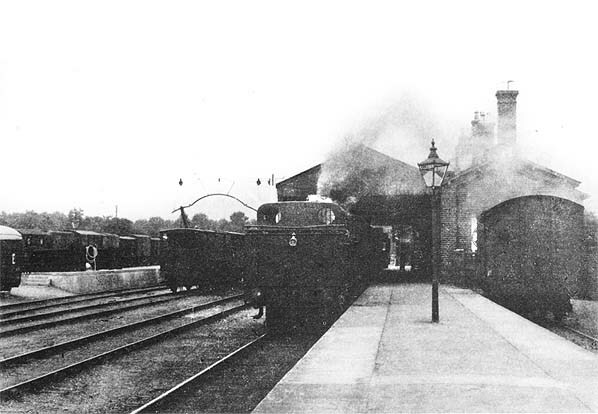 Horncastle station in the early 1930s with its overall roof. This 1897 OS maps shows the unusual arrangement at the goods shed which was sited at tight angles to the station, although one siding runs through it this could only be accessed by using the wagon turntable on the run round loop. Note the ticket platform to the south of the station. 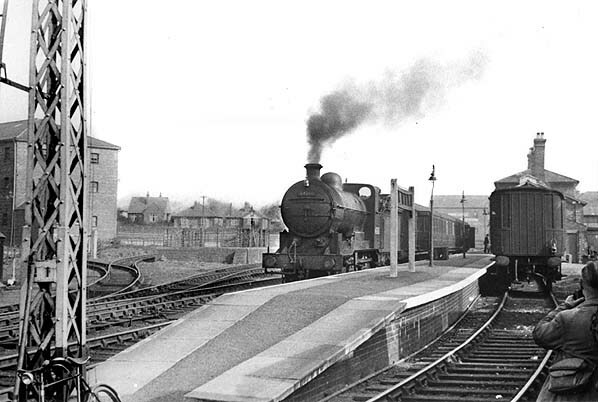 Horncastle station in April 1954. The bay platform is seen on the right with the granary on the left. 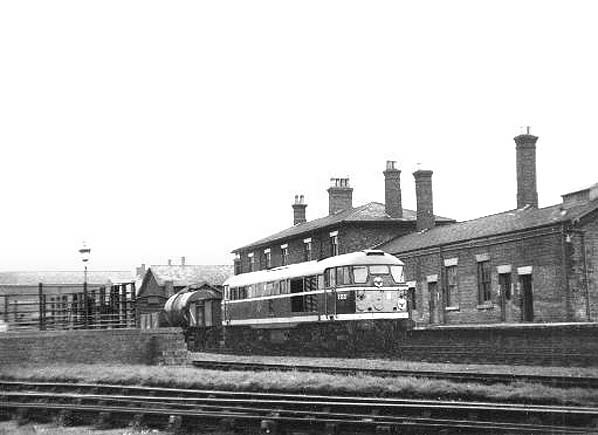 Horncastle station c.early 1960s. The goods shed is seen on the left. There was a wagon turntable on the run round loop with a line crossing over the platform line and into the goods shed, In this view the door has been removed and replaced by a window and the turntable has gone without trace. Photo by Adam Cartwright from Lincolnshire Railways from the past web site.